Elise Strachan from My Cupcake Addiction is an incredibly talented baker from Australia that continues to dazzle us with her creative confections. 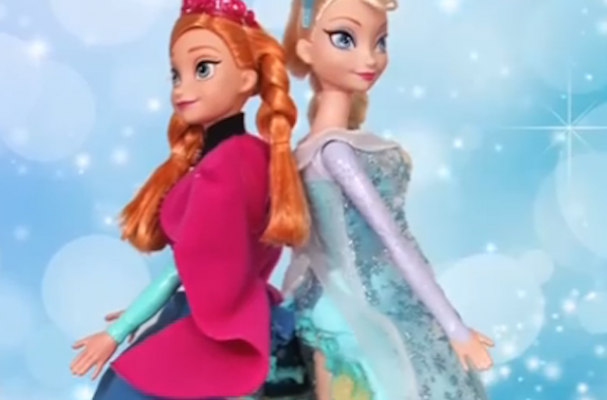 Her stunning Elsa and Anna surprise cake from Disney's Frozen is no exception. This double princess cake will impress any Frozen fan. A tower of frosted cake is filled with blue colored candy and candy snowflakes before the two princess dolls are inserted in the middle. The outer layer is covered in fondant and the details are painted on with luster dust. The video tutorial is extremely detailed so even if you do not have cake decorating experience, you will feel confident preparing this cake on your own.